Stave off the winter blues with “A Breath of Fresh Air” at Windham Fine Arts. Opening Reception Saturday, February 16, from 5:00-7:30 pm. 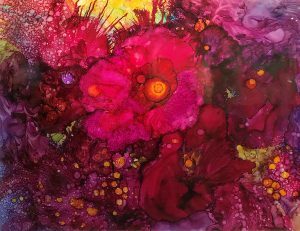 Washed with color, this vibrant floral show features gallery favorites Mireille Duchesne, Olive Farrell, Leila Yassami, Maya Farber, and Ilona Sochynsky. From realism to impressionism, abstract and more, the show promises to invigorate and lift your spirits. Take home a ‘bouquet’ that will last forever! On January 19th, Windham Fine Arts Gallery hosts Francisco Roldán, a classical Latin guitarist who performs nationally and internationally as a soloist, with chamber ensembles, and with orchestras. Roldán has performed in the U.S., Portugal, Greece, Russia, Colombia, Argentina, the Dominican Republic, and more. His venues include the Lincoln Center, the Metropolitan Museum of Art, and the Smithsonian Library. The performance is part of a series of concerts produced by Blackdome Music. The night will consist of a pre-concert wine and cheese reception from 5:30-6:30, followed by Roldán’s performance. This reception will open our new show. Among the artists in the new show will be Ruby Reichardt exhibiting her oil on paper works at the gallery, Matt Horner showing his stone sculptures, and Ilona Sochynsky exhibiting mixed media art on paper. Mark your calendar and purchase tickets! Holiday Show Artists’ Reception, December 8th at Windham Fine Arts, 5:00 – 7:30 pm. The For the Love of Art Holiday Show Artists’ Reception features snowy landscapes of the Catskills with music presented by renowned guitarist, Cue Gerhards. For the Love of Art is an uplifting show of beautiful works of passion and possibilities. Each painting tells a story and conveys why the gift of art is the best gift to give. Paintings in mixed media, oils and acrylics, sculptures, photography, and local scenes await you. Mara Lehmann unveils her newest collection of the Catskills—snowy landscapes, starry nights, and winter wonderlands; each is awe-inspiring. Kevin Cook joins us with his latest works influenced by the great American painter, George Inness. Shimmering with color and feeling, Kevin’s paintings capture nature and its mystique. Velvet Skies, a painting of NYC in the snow, by Joseph Keiffer simply grabs you. With additional works of vivid and stunning imagery of the Catskills, Joseph is at his finest this holiday. Mireille Duchesne stuns with abstract paintings of winter skies, creeks, and ponds. Artwork is also available from our many esteemed artists including John Greene, Adam Colangelo, Tom Key, Kim Do, Olive Farrell, Lisbeth Firmin, and Maya Farber. Windham Fine Arts is opening a dedicated space of local scenes. Downtown Windham, the Hudson River, North Lake South Lake, Windham Mountain, Kaaterskill Falls, plus skiers, hikers, and country roads. There’s artwork for everyone visiting our town and the Catskills. Local Scenes offers gifts to share or that ‘little something to take home’ — a memory of the Catskills, our gem in the sky. 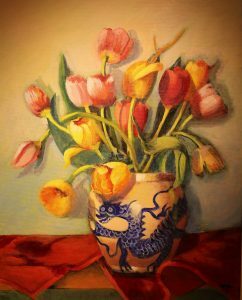 Featured artists include Susan Cushin, Kim Do, Mara Lehmann, Kevin Cook, Olive Farrell, Maya Farber, Scott Balfe, Tom Key, Anne Johann, and Robert Schneider. Opening Reception, December 1st at Windham Fine Arts, 5:00 – 7:30 pm. Beautiful works of passion and possibilities created by esteemed artists are displayed. Each painting tells a story and conveys why the gift of art is the best gift to give. 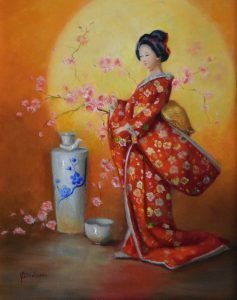 Paintings in mixed media, oils and acrylics, sculptures, photography, and local scenes await you. Showing now through December at Windham Fine Arts. Cue Gerhard’s guitars are a unique work of art. Known throughout the music industry for his expertise, integrity, and passion for achieving uncompromising quality, Cues’ one-of-a-kind guitars are a must see and must have. Pioneering exotic color combinations and artistic finishing techniques, Cue combines more than 40 years as a woodworker, finisher, luthier, and working musician. Opening September 1st, Windham Fine Arts presents two new art shows: Copper, Clay, and Steel in the North Gallery; Figures and Places in the South Gallery. The Artists’ Reception follows on Saturday, September 15th, 5:00 to 7:30 pm. It’s a love affair that began in his grandfather’s workshop, says Adam Colangelo, experimenting with scraps of copper during his formative years. In the years since, Colangelo has created signature pieces in copper producing patinas and finishes so rich in detail, causing one to pause. Lisa Battle crafts distinctive abstract sculptures by hand building them with stoneware clay. Inspired by patterns created through wind, water, and motion, each piece is pit and wood kiln fired replicating the texture and subtleties of nature. While steel is hard, Richardo Arango tames it producing abstract pieces both large and small and in color, demonstrating the diversity of this powerful medium.